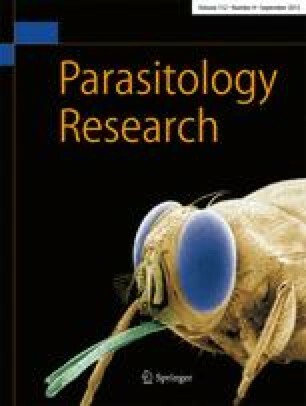 Infections with endoparasites in dogs and cats have been determined by analysing the results of faecal examinations (Flotation, MIFC, sedimentation, Baermann, smear, ProSpecT Giardia Microplate Assay). Samples of 8438 dogs and 3167 cats from the years 1999 until 2002 have been included in the investigation. 2717 dogs (32.2%) and 771 cats (24.3%) have been infected with endoparasites. In the infected dogs the following parasites have been identified: Class Nematodea: Toxocara canis: 22.4%, Toxascaris leonina: 1.8%, Ancylostomatidae: 8.6%, Trichuris vulpis: 4.0%, Capillaria spp. : 2.3%, Crenosoma vulpis: 0.9%, Angiostrongylus vasorum: 0.3%; Class Cestodea: Taeniidae: 1.2%, Dipylidium caninum: 0.4%, Diplopylidium/Joyeuxiella: 0.1%, Mesocestoides: 0.2%, Diphyllobothrium latum: < 0.1%; Class Sporozoea: Sarcocystis spp. : 9.0%, Cystoisospora spp. : 22.3%, C. canis: 8.0%, C. ohioensis: 17.0%, Hammondia/Neospora: 1.7%; Class Zoomastigophorea: Giardia spp. : 51.6%. In the 771 infected cats the following prevalences of parasites have been found: Class Nematodea: Toxocara mystax: 26.2%, Ancylostoma tubaeforme: 0.3%, Capillaria spp. : 7.0%, Aelurostrongylus abstrusus: 2.7%; Class Cestodea: Taeniidae: 2.6%, Dipylidium caninum: 0.1%; Class Sporozoea: Sarcocystis spp. : 2.2%, Cystoisospora spp. : 21.9%, C. felis: 15.3%, C. rivolta: 7.9%, Toxoplasma/Hammondia: 4.5%; Class Zoomastigophorea: Giardia spp. : 51.6%. This issue was originally published online as Supplement 9. This was corrected in November 2003 to Supplement 3.